Warbird Adventure Rides has been established to provide rides in these historic World War II aircraft. These rides are enabled under the Civil Aviation Rule part 115, a ‘new’ CAA initiative which controls all forms of Adventure Aviation. This requires that our aircraft, operations and crew come under the scrutiny of Civil Aviation which guarantees you the highest possible levels of safety. 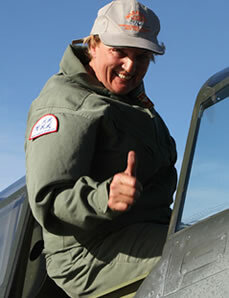 The Principle of Warbird Adventure Rides is Liz Needham. Liz is one of New Zealands most experienced pilots with over 20,000 hours flying experience over 37 years. Liz owns an aviation training school, flies for a major airline and has been involved in Warbird Aviation for over 12 years. She is ‘No 2’ in the NZ Warbirds Association Harvard “Roaring 40’s” Display Team and flies the P-40 Kittyhawk in the display circuit. The Operations Manager and Chief Pilot is Frank Parker with over 15,000 hours experience. Frank started his flying career with the Royal New Zealand Air Force, being one of the last air force pilots to complete his basic training on the Harvard. Frank has been involved with Warbirds Aviation for over 12 years, Leads the NZ Warbirds Association Harvard Team and regularly flies a variety of Warbird Aircraft. Both Liz and Frank are passionate about their Warbird activities and have established Warbird Adventure Rides Limited to share this experience with you.